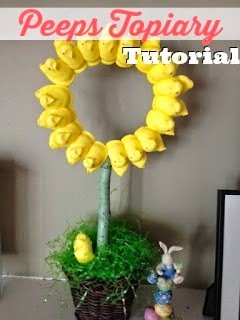 I'm not a huge fan of eating Peeps, but decorating with them...why, yes, I will do that! I love how this little peeps topiary came out and it wasn't too difficult aside from a few minor top-heavy issues. So what you'll need...four boxes of chick peeps, spray paint, a basket or pot for the base, a stick or dowel no less than .75" in diameter, a cross stitch hoop, floral foam and Easter grass. Start by spray painting your dowel or stick. You pick the color, I went with green because I had it on hand. Put the floral foam into the basket or pot. It's a good idea to add some newspaper to the sides if it's not snug against the side. Now, the original project, in Women's Day Magazine, suggest hot gluing the dow to the hoop right at the screw first and then hot gluing the peeps (keep them in attached sections of five). Well, I got news for you people, I'm impatient. I didn't want to wait for the stick to dry so I glued the peeps to the hoop, as it laid flat, before I attached the dowel (you will need a lot of hot glue!). Here's the thing, the ring of peeps is so heavy there's no way a skinny dow or whimpy stick is going to hold this thing up once you place it in the floral foam. If you use a support that's too narrow, the weight of the peeps ring will have it falling over in no time. I admit, I ran into some trouble, even with the large stick I was using. So just imagine me, scrounging through my kitchen drawers with one hand and trying to hold this thing together with the other. Ah ha, I find a pair of wooden chopsticks within reach and decided I will use them to add extra support. (Gotta love leftover Chinese!) They are easy to hide behind my stick and they easily go into the foam piece I have hidden inside the little basket. I used some floral wire to connect the chop sticks to the topiary stick and all was well with the world. Once you have it standing upright, just add your Easter grass to hide the floral foam and find the perfect spot. Seriously, it better be perfect because this isn't an Easter decoration you're gonna want to be moving around much.